The beautiful town of Erice sits at 750mt above sea level on Mount San Giuliano, cool even in a hot Sicilian summer, and just 15km from Trapani. According to Thucydides Erice, like Segesta, was founded by Elymians fleeing Troy, but it was a city like no other; a sacred place dedicated to the goddess of love and fecundity, Aphrodite for the Greeks, Venus for the Romans. The consecration to the goddess is confirmed by the remains of the Venus Erycina temple, upon which, between the 12th and 13th centuries, a castle was built called “di Venere”. 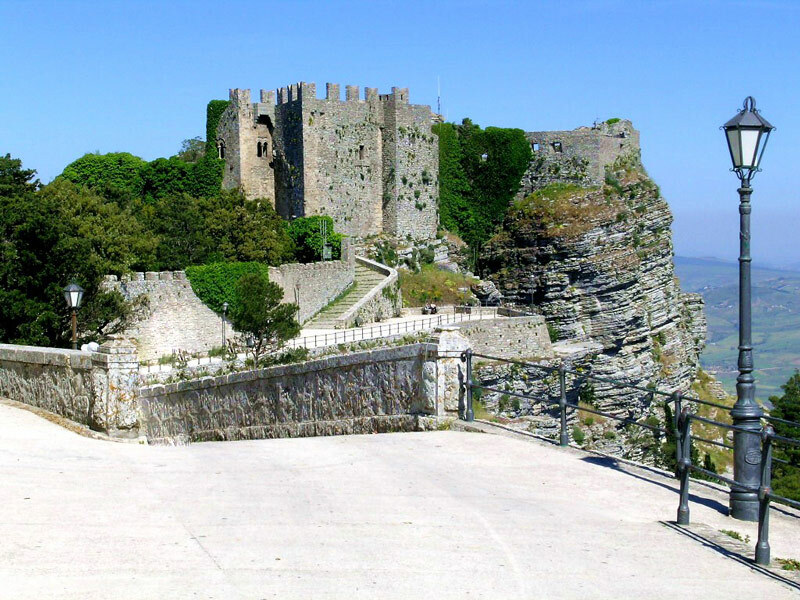 The name Erice, instead, comes from Eryx, Aphrodite’s king son. The legends surrounding the town are interwoven with the cult of the goddess of love and the practising of sacred prostitution, the feats of Heracles and even the name of the Trojan hero Aeneas, he too a son of Aphrodite arrives here after the destruction of Troy. The sacral charm of the place is further enhanced by the perfect equilateral triangular town plan that has always given rise to mysterious or symbolic interpretations. 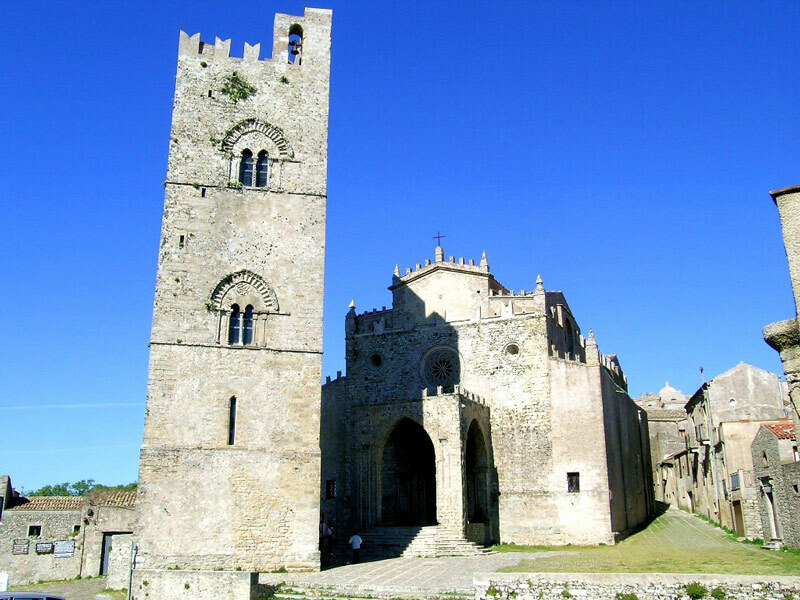 If only a few traces of these antique origins are still visible, Erice, which again became prosperous under the Arabs and continued to be so under the Norman and Aragon reigns, still has a magnificent medieval aspect with innumerable churches. The cobbled streets and squares today welcome numerous local craft shops. Rugs are among the most popular artefacts, fruit of the Jewish traditions of weaving and dying that prospered here all through the middle ages. The exquisite almond cakes are another speciality now baked and sold in the town’s excellent pastry shops. Just as in nearby Trapani, the Holy Week rituals here are extremely interesting; while in summer Erice puts on numerous cultural events in keeping with the spirit of the place. The Ettore Majorana Centre hosts international scientific conferences. It is not said that it will happen to you, but if it does it will be a fascinating experience: not infrequently, fog rises and envelops the medieval streets and woods around the town and lends a northern and even more mysterious feel to this unique place in Sicily: perfectly conserved, uncontaminated by modern buildings and with a charm completely different from that of sun and sand (though very near to the sun and sand along the Trapani shoreline).